Designed specifically for manhole restoration and protection, CLADLINER products use next generation epoxy composite material and are designed to perform in conditions with a pH of 1 or less (250 times more chemically resistant than calcium aluminate and 200 times more chemically resistant than pure fused calcium aluminate). In addition, products contain a highly effective anti-microbial additive. 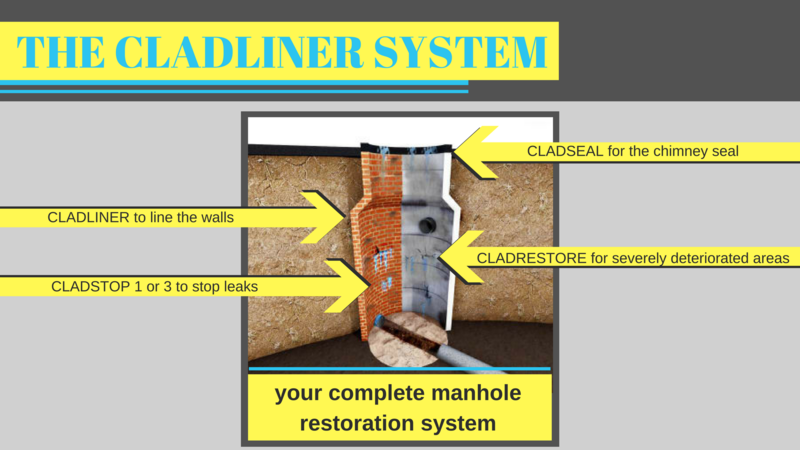 CLADLINER prides itself in providing outstanding quality products for the manhole industry. The next-generation manhole liner with the simplicity of cementitious lining with the performance of a high-build epoxy, all in one product. Advanced elastomeric manhole chimney seal with balanced properties of elongation and strength. One minute rapid setting hydraulic cement designed for structural patching and for use as a leak stopper and water plug. Three minute quick setting hydraulic cement material designed for filling/patching and for stopping leaks as a water plug. An industrial-grade, early high-strength, high-density cementitious mortar, that is often used for repair and restoration.